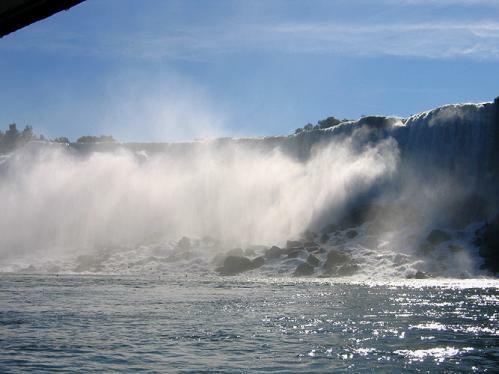 Blog from Niagara Falls, Ontario | Where in the World is Vic? The next day after breakfast and being re-united with the rest of the family, Lillian & David's daughter Jennifer & I set off back in the direction I'd come the previous day to Niagara Falls. First stop before the falls however was one of the many wineries in the Niagara region. We stopped at one called Reif where we sampled some delicious white & rose wine before trying some Ice Wine. Ice Wine is made when the grapes are picked and pressed when frozen. This means the juice is extremely concentrated and hence extremely sweet dessert wine is produced. This was absolutely delicious however there was one slight problem (apart from the lack of space in the suitcase!) which was the price as I decided that $50 a bottle was a little out of my range now I'm on a budget. I did however purchase a nice bottle of rose to enjoy over the weekend. We then continued along the Niagara River to a small town called Niagara on the Lake, where we had a late lunch and a look round the quaint little shops - sadly no purchases although I did taste a very nice piece of cheese!!! After this we headed towards the Falls, stopping at the Brock memorial and the Niagara Parks Floral Clock before arriving at our hotel. Once we had freshened up it was time to explore the town of Niagara Falls. In my opinion it's like a mini Vegas with only one Casino as the main strip down to the falls had loads of attractions (eg Louis Tussads, Frankenstein Museum etc). First stop was "Maid of the Mist" where after donning our plastic rain coats we boarded the boat, to first sail past the American Falls (so named because it's on the American side of the river!) before going into Horseshoe Falls and getting rather wet! We then went on "Journey Behind the Falls" where you walked through a tunnel, wearing another plastic rain coat, with various openings and were able to see the falls from behind! There was also a viewing platform which at the near end which allowed you to get in close to the falls. At this point it was becoming dark which meant the falls were illuminated so you could continue to see their beauty in the dark! We took the Incline Railway back up the hill before going for a late but quick dinner followed by a trip on the Sky Wheel (a smaller version of the London Eye!) to get another view of both the Falls and the town. Next morning the weather wasn't co-operating and it was starting to rain however this didn't dampen our spirits. We went on the "White Water Whirlpool Walk", a boardwalk about 5km down stream from the falls which allowed you great views of the treacherous rapids as well as paying homage to the people who have tried (and in some cases failed!) to cross the river swimming or on tightropes. Our final stop was "Fury of the Falls" which showed how the falls were created before another raincoat and a 4D animation of what it feels like to go over the falls! Thank you Jennifer for showing me Niagara I really appreciated it and had a great time!